In today’s article, I will discuss an aspect of trading that occurs fairly regularly. To illustrate, please notice the three attached charts. 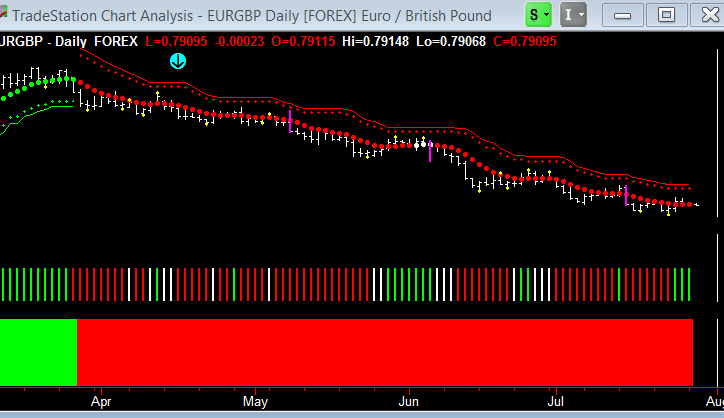 They are the weekly, daily, and 720 minute charts for EURGBP. Also, before we dive into this, I want to emphasize that what I’m showing you applies to any timeframe you happen to be trading. 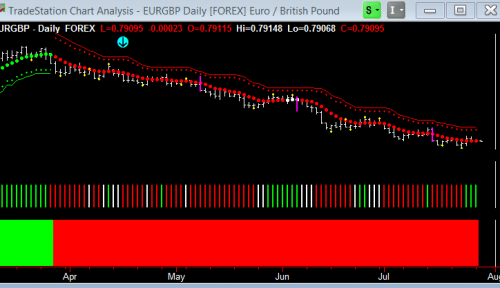 As you can see on both the weekly (above) and daily (below) charts, the Hawkeye stops are indicated with a cyan arrow. Now, let’s consider the faster timeframe, which is the 720 minute chart below. Notice the red arrows. I call this “Walking Down The Stairs,” because of how the stop and crash barrier indicators look like a staircase. Of course, the principle of “walking up the stairs” also applies when trading in an uptrend. 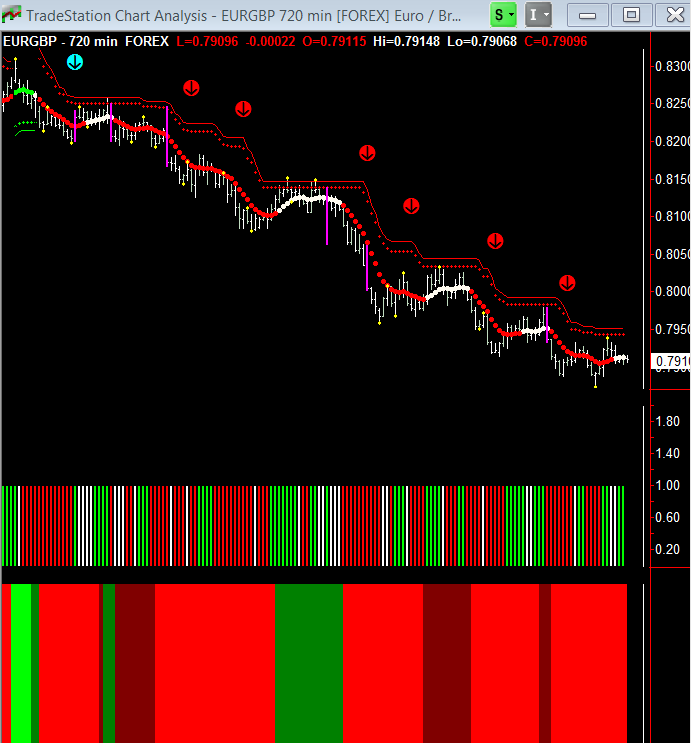 Anytime you’re trading on a triple timeframe, the fastest timeframe will exhibit this “stair-case” profile. Also, notice how as you go from one red arrow to another, there’s a period where it all goes flat. This is what I call the landing. Then from there, notice how it continues stepping down to another landing, then a third, a fourth, a fifth, and a sixth, etc. One of the biggest weaknesses I see in many traders is they can’t hold trends. However, in order to become a consistently profitable trader, you’ll need to be able to identify this frequently occurring chart behavior and most importantly, learn to trade through it. Being able to identify where the landings are will really help you, because by doing so, you will see how the market steps down in harmony with the two other timeframes. So, by learning how to quickly identify this behavior and trade through it, you can reap larger profits throughout the rest of your trading career. It goes back to what you always say Nigel…..rather than trading on emotion, the six ways the market moves allows you to converse with the market, instead of being shaken out on fear! Great example…thanks for sharing! Next PostNext The Emini’s Recent Drop? Here’s What Hawkeye Foresees!